Candy Village: Stroll through this delicious town full of sweets and goodies. It's time to clean house on this Winter Wonderland. Rewards are Holiday Wreaths! Happy Winterfest! The holidays arrive to Dungeon Boss with a brand new Winterfest event featuring new rewards, quests, skins, and a brand new hero! There's a lot to go over, so we've created an FAQ at the end of this post, but for now, let's hit the big beats! The Winterfest Calendar: This advent calendar will let you unlock 1 door per day with special keys and offer rewards and quests! Winterfest Event Shop: Collect Holiday Wreaths and spend them on exclusive items in the event shop! New Hero: Grog-Gnog, son of Kang-Kung! Read all about the new half-beast, half-ogre water Hero here. 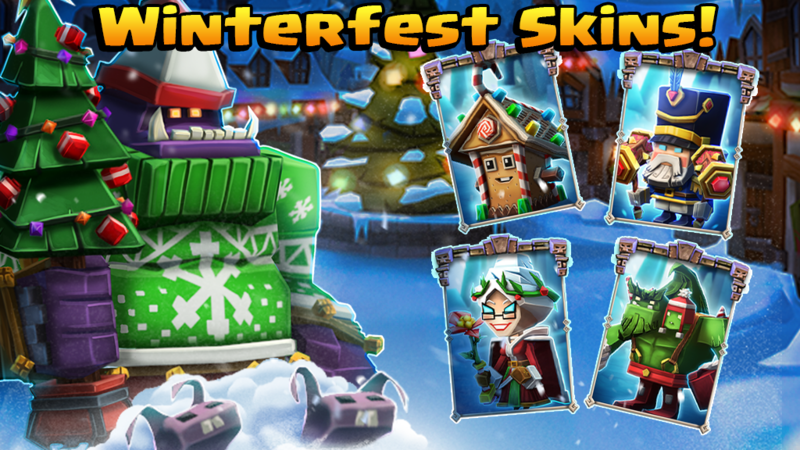 Holiday Skins: Much like in the Halloween event, new Winterfest skins will be available for sale in the Shop throughout the event. Check out the preview all the new skins in the image below! Holiday Wreath bonuses for PVE, PVP, and Tower of PWNage: Check each day, as these will be changing daily! Who's in the Heroic Portal? Jackpot Portal with Kai as a Guaranteed Unlock with 10x Heroic Summons. The Boss That Stole Winterfest: Defeat Grumpus Grog Gnog at the top of the tower of PWNage for Grog Gnog tokens and more! PWNed: Defeat various floors in the Tower of PWNage for Holiday Wreaths. Day 2 Quest (you must unlock Door 1 and 2 in order to get these quests) and update! Holiday Raid Parade! : Win PvP matches for Holiday Wreaths and spend them in the Event Shop for last year's holiday skins! We've added keys as rewards for PvP Tournaments, starting with the next one! Santa's Workshop: Come cause some holiday mayhem and see if there are any presents for you in this special dungeon! Fight off Mrs Claws Icebloom (that's her evil name) for Water Evos & more! Herding Reindeer: Defeat Lupina reindeer! They're rampant in the islands-- extra gold and XP drop from reindeer. They can also invade other dungeons! Defeat them for Lupina tokens! Kozar's Coming to Dinner!/Ogre Reunion: Meet the family. Ugly Sweater Kozar and his may relatives are here to bring you holiday cheer! Get rewarded with Gold and Dark Evos. Additionally, you can purchase the Ugly Sweater Kozar Skin in the shop. Decorating With Evos: Collect & craft Evos for Wreaths and a Heroic Portal Summon! New Holiday Skin Previews are below! Winter Wonderland: Battle your way through a winterland of loot! You all get a golden key in your bossmail! Merry Winterfest! Gone Caroling: Win dungeons with Elemental Teams & Win PVP with Different Elemental Heroes for Holiday Wreaths! Check quest for specifics! Toy Army: King Valkin and his army are here fight in this Winter War. Get tokens and evos! Sparkle Scavenger Hunt: Hunt down holiday sparkly objects for rewards! The Ogre's Den: Lions and Pigs and Ogre's Oh-My! Time to save this winter and bring back the presents! Finish the dungeons for Evos! Holiday Spirits: Defeat the ghosts of Christmas past, present, and future-- they have a chance to respawn from defeated enemies--for Brom tokens! What the Kang-Kung is Winterfest? 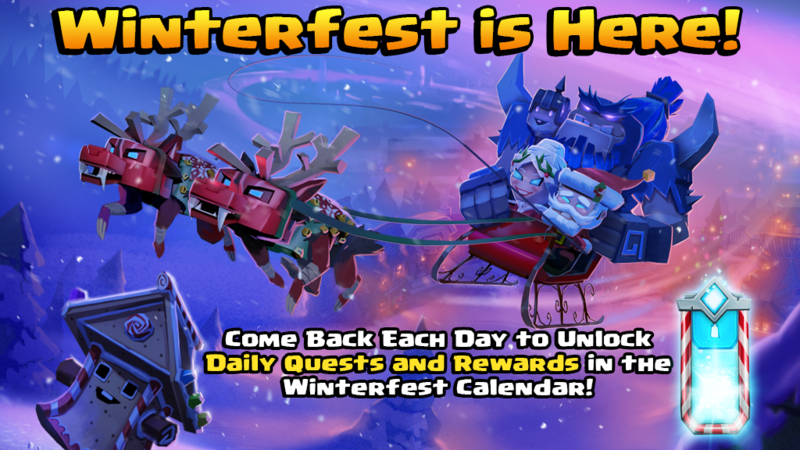 Winterfest is our special Holiday event featuring a Winterfest Calendar that will give out daily quests and rewards! You must acquire keys in order to unlock the next door. Keys can be obtained in the Event Shop with Holiday Wreaths, the event currency. How do I get Holiday Wreaths? Glad you asked! You’ll be able to get them by completing Event Quests and on certain days, you’ll be able to get them in chests at the end of Campaign Dungeons and in PVP matches. Oh, and the Tower of Pwnage will also be giving out wreaths for completion (it will also have a special quest on certain days for wreaths). How does the Winterfest Calendar Work? On the first day of Winterfest, my true Imp gave to meee…..three different keys! All right, so, here you’ll have a calendar with 14 doors. Each day, a locked door will be highlighted corresponding to the day of the event (provided that you have unlocked all doors up to that point). Use any one of three keys—bronze, silver, or gold—to unlock a door for an awesome bundle of rewards. Choose wisely, though! Each key provides a different bundle of rewards and you can only unlock a door ONCE. Once a door is unlocked, you’ll also unlock daily quests for that day! Complete them for Holiday Wreaths and even more rewards. Great! Now…where do I get keys? As mentioned, there are three different keys available. You can obtain bronze and silver keys in the Event Shop by spending Holiday Wreaths. There is a single gold key available in the Event Shop for Holiday Wreaths, but you’ll have to purchase any additional gold keys. What kinds of rewards are behind the closed doors? Each day and each reward tier is different! You’ll find tokens for new Hero Grog-Gnog, Stamina, Runes, Heroic Summons, Gold, Evos, Loot Keys, other Hero tokens, and even some surprise bonuses! Come back each day to check them out! If I use a key to unlock a door, can I go back and use another key on the same door to get the remaining rewards? Nope, nice try though! You’ll have to choose your key/reward wisely as each locked door can only be unlocked once. What time will the next locked door in the Winterfest Calendar be available for unlocking? How long do I have to complete the dungeons and quests I get when I unlock a door? You'll have 24 hours to complete any event dungeons you unlock, starting when you unlock them. This means you could potentially have multiple event dungeons unlocked at the same time and they might disappear at about the same time. Some quests will last 24 hours, and others will last longer. If you need to be reminded about a timer, just check you Events screen. I just unlocked the first day and it's telling me to Defeat Grog-Gnog in the Tower of Pwnage, but you guys didn't warn me and I already completed my Tower and now I won't be able to complete the Quest! Why are you guys so cruel? Whoa there! Check the Event banner for the quest! You have 14 days to complete this quest! AH! I just found out about this amazing event! What if I join in the 7th day of the event…do I miss out on the earlier quests and rewards? Nope! You’ll be able to unlock each door and finish quests up to the 7th day! These daily event quests are tough! Do I need to finish them to be able to unlock the next day’s door? Nope! Daily quests are not mandatory — but they are one of the most efficient ways to get wreaths. What happens if I run out of doors to unlock on Day 14? You’ll want to hold on to any extra Holiday Wreaths and Keys…we’ve got a special surprise waiting. Where are all the Holiday Skins I see in the art? We’ll be releasing the new Holiday Skins individually throughout Winterfest in the Shop for purchase as part of a bundle. Keep an eye out for them! Do I get a bonus for wearing Holiday Skins? You sure do! Any Hero wearing a Holiday Skin will have bonus starting energy in PVE and PVP! How do I get the new Hero, Grog-Gnog, son of Kang-Kung? Grog-Gnog is only available during this event (for now)! Get his tokens from Unlocked Doors and one of the event Quests! Additionally, if you unlock all the right doors (including the not-so-secret-now bonus event) with gold keys, you will have accumulated enough tokens for six-starred Grog-Gnog! Can I go back and unlock say a day 2 door on day 5? So wearing holiday skins only gives energy and not extra wreaths right? So to unlock the quests that give wreaths.. you need to get wreaths to buy a key. This seems backwards. It's the first Day of Winterfest and I have just jumped into the event, but I have a good feeling that this will be amazing! Thank you for this event DB team!!!!! Is each key a single use and then it's destroyed? Also, if I'm understanding correctly, realistically, to open the first door today, I would need to collect a bunch of wreaths via Tower/PvP, and then purchase a bronze (most likely) key to open door #1? Yes, but you can't unlock door 3 until you unlock door 2, even if it's day 5. 14 doors, 1 for each day, so yes. "How do I get Holiday Wreaths? Glad you asked! You’ll be able to get them by completing Event Quests, tapping on sparkly objects..."
Im seeing no sparkly objects other than the normal ones and they are not giving wreaths. Am I missing something or is this comment underlined above not quite accurate? This is nuts. Exciting and overwhelming. I can't wait to dig in. Just finished one campaign level and was rewarded 15 wreaths. Only 54,985 more to get the first skin. I hope there will better ways to earn wreaths. 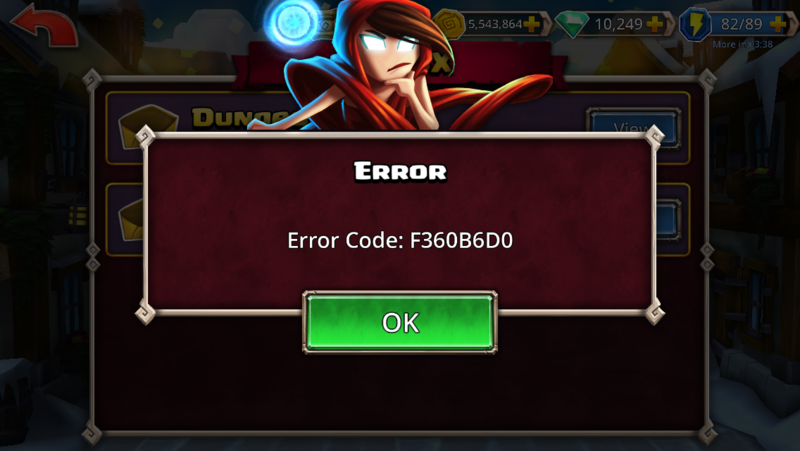 @Joel Getting a 7AD89461 error code when trying to accept the keys in the boss mail. Also (not paying attention), I seem to have a lot of wreaths, did they carry over from last time or something? So you start with a gold, silver and gold correct? Did anyone else get a mail with more keys? I got one but when I clicked on it I got an error code and got kicked out when I clicked accept. Sorry, it seems Joveth still had Haunted Halls on his mind. Wreaths do not pop out of sparkling objects, sorry for the confusion! We're aware of the key issue and are working on it now. We're aware of this and are working on a fix right now. You can see the latest on the issue here. Can I let multiple days of doors build up and then go back and choose which keys to use based on what the rewards are behind each day? Prices for event items is insanely high.. 55,000 wreaths for a skin ? Seriously ? Additionally, if you unlock all the right doors with gold keys, you will have a six-starred Grog-Gnog! Crap! Is today one of the right doors to go gold key on?? 30 seems light... but it's so hard to know! So... you can only get a single gold key all event long without knowing when the best time will be? That's not cool. Also, if you are going for the plain cashgrab, could you please at least sell them in convenient bundles of say 13 or 6? If I had to guess, you probably need to open all the doors with gold keys that give any amount of Grog tokens. So you mean If all the doors opened with gold keys, their would be 600 new hero token? Or there is one full unlock in some door?